My experience in government has spanned across municipal, provincial and now federal jurisdictions. It is obvious that the public sector across levels has been experiencing an organizational identity shift. Meaning that society is changing and governments are beginning to see the need to adapt to hold their influence and place in Canadian society. As the organization is required to shift, the term ‘innovation’ is seeping into the policy and everyday dialogue of policy and public servants. Within government, there is policy in place to support innovation and a declaration that supports innovation across all provinces and territories in Canada. Yet, for some reason policy alone is not enough. There are varied conceptualizations of what innovation means and how it is applied; it signals a noticeable cognitive misunderstanding, and a deep lack of skills sets or competencies within public servants to work in innovative ways. ● and most innovations that do thrive tend to be situated within small groups of people who have great ideas, and who have figured out how to work around the system. This way of innovating has a high level of risk to individuals’ careers, and does not create institutional memory for sustainable and system wide innovation. Naturally, innovation in government is fragmented. From the perspective of a federal public servant, when it comes to innovation, the federal government operates without a systems view; we often act like mini, distributed organizations working on individual projects. For example, I notice several teams working on digital change work. Digital change is promising for Canadians Digital future because it can support how Canadians engage and build trust with government, yet may I ask, are all the groups working on digital operating with a shared purpose? 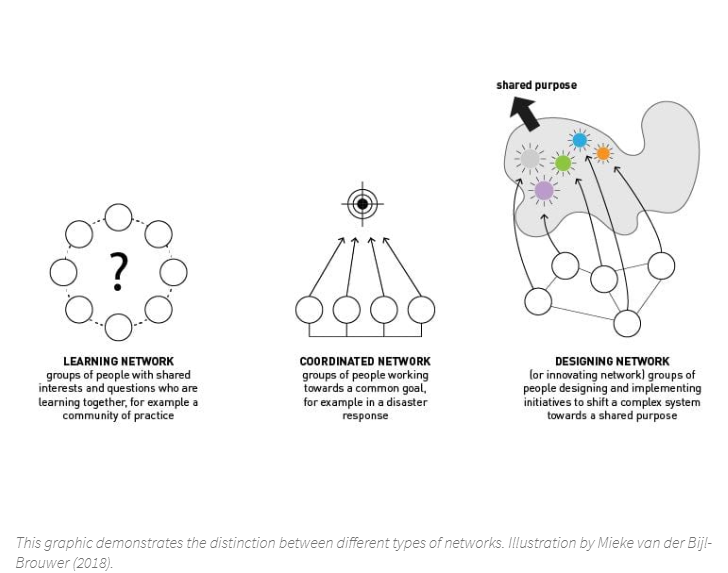 What if the concept of design networks was activated? This model requires more than just collaboration; it needs shared purpose. A designing network functions as groups of people designing and implementing initiatives to shift a complex system towards a shared purpose. @GC_talent, and the Recover project Edmonton are key examples of innovative projects that have worked like design networks. These projects have this ability to work inside and outside leveraging what is around them. They see the power of integrating the capacities across sectors and across departments within governments to work together and solve complex challenges. They show us there is power that generates from shared purpose across networks. This approach to problem solving seeks to actively listen to others, acknowledge differences, find commonalities, and design with the ability to integrate the distributed capacities of external organizations and the people in government around a shared purpose. When it comes to innovation the federal government is operating like mini, distributed teams (or sectors) with some of the heaviest challenges in the areas of HR, procurement, and the way in which grants and funding is distributed and managed. What if we could consider thinking about a design network as a fundamental building block for our innovation future? Mobilizing this could support how the organization can re imagine how the public sector looks at combating the siloed innovation pods within a connected network and the development of disciplined innovation platforms, business processes and practices. Wisdom to break down the distributed silos, learn about each other, and share the successes and failures of working in new ways so that we can improve as we go forward. I want to continue this conversation…. If you are interested in starting this up… get in touch and add to this conversation.